The observatory is located on the waterfront in historic Bayview, MI. There are no plans for any public viewing at this time, but the first clear sky clock below reasonably serves Petoskey and Harbor Springs. The second clock is near to the sister site in Texas. 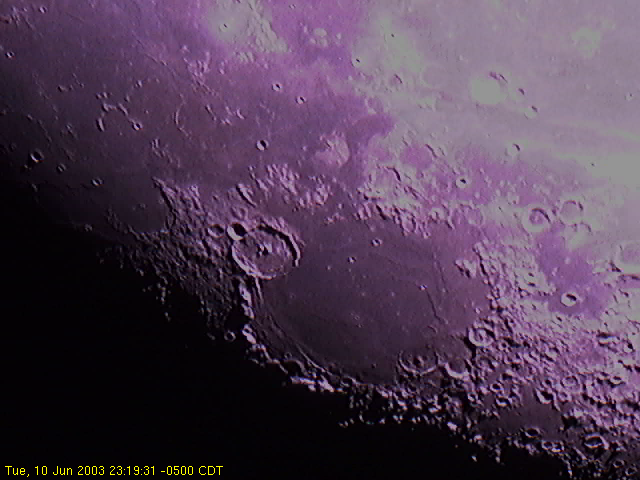 photos taken at the observatory in Michigan, and some taken in Austin, TX. Orion Skyquest XT6 telescope. First Light 9/2001 in Austin TX, 27 May 2003 in Bay View, MI. Orion Skyquest XT10 telescope**. First Light 24 May 03 in Austin TX. Laptop computer*, running Linux and some form of Windows. Cannon 35mm camera and mount*. Logitech Quickcam 4000 Pro*. First Light 2/3 June 2003 in Bay View, 10 June 2003 in Austin, TX. Modifications of the QuickCam 4000 Pro for Astrophotography. The author, her wife, and some family friends took a trip to the McDonald Observatory. Austin Astronomy and Science, an equipment shop with helpful staff.